(1) Mimics the modulation found in typical situations, including the current placebophile paranoia: HDMI jitter. (1) Primary Jitter frequency which is the same as displacement in the frequency domain of the primary set of sidebands from the carrier when we modulate a single pure tone. (2) Primary Jitter amplitude which is the height of the first pair of sidebands as compared to the carrier. (3) Jitter shape factor which is the rate at which the sidebands fall off with increasing order once we progress past the first few harmonics. (1) The source component (BD player, Cable Box, or AV Player). (2) The specific recording because a lot of HDMI jitter relates to the frame rate which itself can vary among recordings. (3) The specific A/C component that takes in a digital signal from a source component and puts out analog signals (Surround Processor, AVR, DAC, etc.). 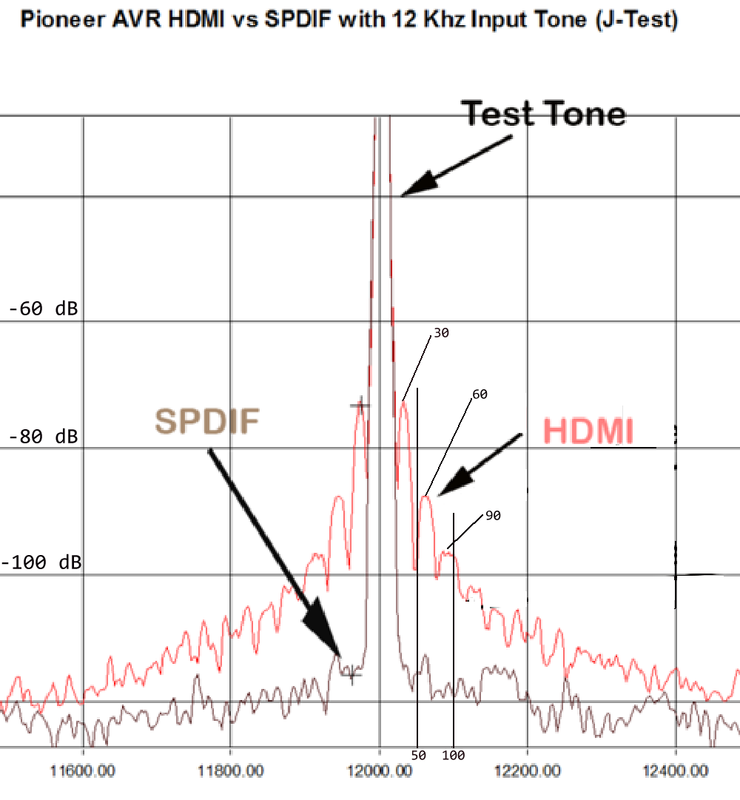 In the test above, the primary jitter frequency is 30 Hz, the primary jitter amplitude is approximately -77 dB, and the primary shape factor is about -6 dB per octave after the first few harmonics of the primary jitter frequency. Rather than try to mix and match all of these influences by testing different real components, it seems to be be more reasonable to ascertain a range of jitter frequencies that would be tested. I figure that it would take from 5 to 8 different sets of ABX tests to gather a fairly complete set of data about this issue. The independent parameter of each set would be the jitter frequency. Each set of ABX tests would involve 5-8 different tests. The independent parameter of each test would be jitter level. (2) Is at extremely exaggerated levels in order to be audible to most people. Doable given that there were listeners who would actually perform the 25 to 64 different ABX tests that would be required, at least 16 trials each. The original content should contain music that that was optimally recorded and produced. If a synthesized signals makes the jitter easier to detect, it should be included as well. It may need to be more complex than a single tone. I think that using synthesized signals has its place and may be a valuable tool for listener training, but in the end it is all about how typical music, dialog, and EFX (simulations or samples of natural sounds) sound. So how much jitter was in the files? I tried the files on https://web.archive.org/web/20130907071133/http://www.cranesong.com/jitter_2results.html and was able to make out the difference of 300hz 300ps in ABX. Is that site trustworthy? Can you correlate your tests to ps estimates? Thank you! Thank you for the information as I was completely unaware. I read many of his posts including the one on channel delay audibility which completely changed my beliefs on the matter. His contributions will surely continue to be useful and enlightening to many through the internet for a long time to come. The 'jitter' is caused by a sloppy clock in the HDMI to audio conversion. There is nothing in the early portions of the process (including CDROM timing) unless it is resolved back down to audio and back to digital that can cause signifncant jitter. So, using HDMI with sloppy conversion hardware (which is essentially an D/A converter) will certainly cause jitter. Jitter IS bad, but I didn't realize that some HDMI converters were THAT bad. (There are mechanisms for micro amounts of jitter to propagate through hardware, but it is by far ground and radiation that causes the non D/A & LAST clock jitter.) The propagated jitter through digital hardware is diminished greatly for every clocked buffer used, and is probably totally nil at the first step. Sloppy HW can let stuff through, in a data circuit way, but that will not really happen. IT IS 99.999% ground and radiated issues, and good RF design will 'totally' eliminate that. The HDMI stuff has always worried me, because there is little reason for the normal HDMI converter in the last HW to be of any reasonable quality at all.